1 Why is it called Persian? Persian wool yarn is the most commonly used type of yarn for needlepoint work. It is commonly referred to as Persian yarn or Persian wool among needlepointers. Pretty much every shop that sells needlepoint materials will sell Persian wool yarn, although the size of the selection will of course vary from one shop to the next. Today, it is also possible to order from an enormous range of Persian wool yarn online. Persian wool yarn is sold in skeins, hanks and cards. 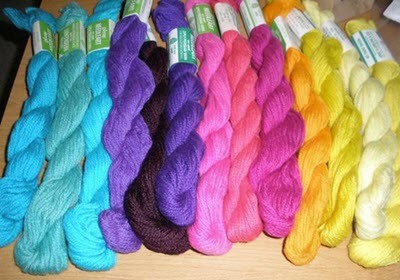 Some shops also let you buy individual strands and pay either per strand, by length or by weight. Why is it called Persian? Because it has traditionally been used to repair Persian wool carpets. Understandably, a yarn that is strong and durable enough to repair carpets can also be used to make very durable needlepoint work, e.g. on upholstery that will be exposed to wear and tear. Typical Persian wool yarn consists of 3 plies of 100% fine wool yarn. The three plies are loosely twisted together and can easily be separated to make finer threads. It is also easy to combine more plies to provide even better coverage. 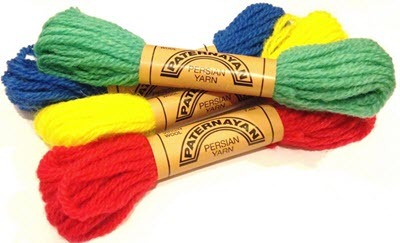 Persian wool yarn is used for a wide range of mesh types, from Petit Point needlepoint with super fine mesh canvas to big Quickpoint mesh – you just need to vary the number of strands accordingly. Each individual ply consists of 2 individual threads. These threads are woven closely together and are not intended to be separated or used individually. Here is a guide that can be helpful if you are a novice needlepointer. It’s not a strict rulebook; as you gain more experience with needlepointing you might want to break the guidelines at times to achieve certain effects. If there is a big contrast between the canvas colour and the Persian yarn colour, such as dark blue yarn on a white canvas, you might need to add an extra ply to prevent the canvas from showing through. Persian wool yarn has a nap with both a smooth and rough texture, depending on the direction you use when threading the needle. When doing needlepoint, I recommend that you always use the direction that gives the smooth structure. So, how can you make sure that you thread the needle right? My preferred method is the lip test. I run a stand of yarn carefully across my upper lip. When the direction is right, it feels smooth. When the direction is wrong, it feels a bit rougher. Important: This might not work well if you are wearing lipstick, lipgloss or similar. Also, you risk staining the yarn.